A total of 34 European players were in action during NBA’s ten-game Wednesday evening. Giannis Antetokounmpo scored 27 points and grabbed a career-high 21 rebounds on his way for his second 20-20 game of his NBA career. 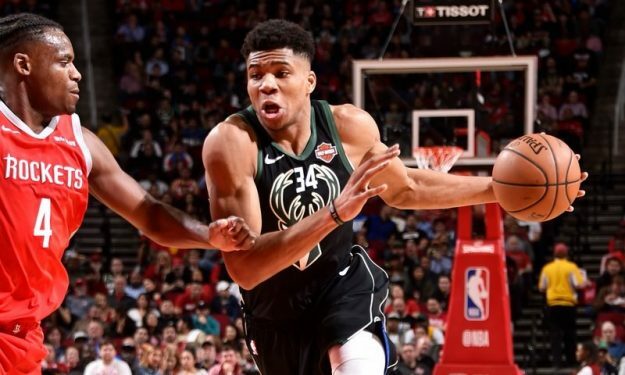 The Greek Freak element was the difference for the Milwaukee Bucks in their 116-109 away win over the Houston Rockets, but Ersan Ilyasova aided with ten points and seven rebounds. Clint Capela posted an 18-point, 13-rebound double-double for the hosts but only made four of sixteen shots from the field. Luka Doncic put up a 30-point show for the Dallas Mavericks in their 104-94 home victory against the Phoenix Suns. The 19-year-old Slovenian played with a back strain, but was 8/14 from the field, also notched six rebounds, five assists and three steals. Maxi Kleber made a surprise start and posted 13 points. Dirk Nowitzki (illness) was inactive. Elie Okobo downed ten points for the losing side, but Dragan Bender didn’t leave the bench. Marc Gasol led the Memphis Grizzlies to the 96-86 win over his brother’s San Antonio Spurs. The 33-year-old Spaniard center posted a 26-point, 14-rebound double-double, Omri Casspi added four points and Joakim Noah also played but didn’t score. Pau Gasol finished up with seven points and 12 boards, Marco Belinelli poured 14 points. However, Davis Bertans was held to three points and was ejected for arguing with the referees, while Jakob Poeltl started but only put up one point. Despite falling in a 21-point hole, the Utah Jazz beat the Orlando Magic, 106-93. Rudy Gobert put in a hand with a 12-point 14-rebound double-double, while Naz Mitrou-Long watched the Regular Season game from the bench and Ricky Rubio (right hamstring) and Thabo Sefolosha (right hamstring) were on the injury list. Nikola Vucevic poured 20 points for the losing side, Evan Fournier was held to one point in 37 minutes and Timofey Mozgov (right knee) remained on the sidelines. Kyle Kuzma sank a career-high 41 points for the Los Angeles Lakers that overcame the Detroit Pistons, 113-100. Ivica Zubac added 11 points and nine rebounds, but Moritz Wagner didn’t score in three minutes and Sviatoslav Mykhailiuk didn’t leave the bench. Jose Calderon had two points for the losing side and Zaza Pachulia (right leg) remained on the injury list. The Portland Trail Blazers continued their winning ways with a 124-112 home victory over the Chicago Bulls. Jusuf Nurkic was once again among the main offensive contributors with 18 points. Lauri Markkanen scored ten points for the visitors but was only 4/12 from the field. Rodions Kurucs helped the Brooklyn Nets recover from a 19-point deficit and beat the Atlanta Hawks, 116-100. The 20-year-Latvian poured 11 points with 5/9 from the field, while Dzanan Musa (left shoulder) remained sidelined. Alex Len had ten points for the visitors and Tyler Dorsey also played but failed to score. The Boston Celtics overpowered the Indiana Pacers, 135-108. Daniel Theis took his part of the offensive load with 12 points, while Guerschon Yabusele added two points of his own. Domantas Sabonis racked up 20 points but wasn’t enough for the visitors, neither was Bojan Bogdanovic who was held to seven points. The Philadelphia 76ers suffered a 123-106 defeat to the Washington Wizards despite Furkan Kormaz’s scoring 16 points in his second straight start in J.J. Recick’s (back) spot. Ian Mahinmi notched six points, eight rebounds and five steals for the winners, Tomas Satoransky helped out with four points and 11 assists. The New Orleans Pelicans escaped a 16-point deficit to beat the Cleveland Cavaliers, 140-124. Nikola Mirotic (right ankle) returned from month-long absence with 17 points in limited action for the hosts. Cedi Osman and Ante Zizic had ten points apiece for the Cavs.